Your post about your daughter returning home prompted me to ask the question about the “treasures” collected from children at school. Recently my two high school children “went through” all the special awards, certificates and artwork I had collected for them from their primary school years all neatly filed in plastic sleeves in lever arch files. They didn’t throw anything out and I am reluctant to as well but they do take up lots of space in our house and, are rarely looked at. One of my children has thrown out most of their school work books and the other one has kept all of them. I know some readers will say scan everything and keep it filed on computer. Any other ideas of keeping those special primary school papers without it being a storage hassle? I have sent Monica my thoughts on the subject but decided to canvas my readers to see what ideas you all had about this. Please feel free to respond with your thoughts and experiences. Good luck with the school paperwork. Do you have a daughter? My sons basically do not care. I went through all the stuff I saved for them a couple of years ago and pulled out a file box full for each — the rest was all in a big tub for each of them and I gave them a deadline to go through it — they just shrugged and asked why I was keeping anything at all (I can’t help it! was the answer). Of course they have a number of container of things they “must keep” and I’m on board — as long as they go through the boxes every year ago and promise that when I can no longer store them and I send them COD they will not complain or ask me why “I” saved the stuff. Interestingly enough, they complain about going through the stuff because they already have — and then inevitably hold up things and ask me why they kept it. So over time they are reducing the boxes…ever so slowly. But I asked about a daughter because I certainly saved practically everything (and what I didn’t my father saved for me). So I’m wondering if the school papers mean something different to girls vs. boys. Plus, I am in awe of you having kept them all sorted and all: I had just stacked things in boxes as they came in…I’m now trying to put those things like certificates that I think they will want someday into plastic sleeves and binders. One thing you might try Monica is to have them pick out their favorite things and put them in an album. You don’t have to scrapbook something to put them in an album. If they have to do their favorite things out of a pile many times they will get rid of it all or a good part of it. Buy them each one 12X12 album with pages and tell them that they can keep the amount it will hold. Right now those certificates may mean something to them because it represents what they are trying to acheive now–graduating from high school. Later that may change as they go through the various phases of their life. If you have given them something to keep them in they can always take things out and discard them and replace them with newer favorites. You said you shared your comments with Monica. Would you share them with us, too? I would love to know what you said! your comment is showing to be your first so may I say welcome to 365 Less Things. I did wonder if someone would pose this question and I will be happy to do that. I will cut and paste it into a comment now. Thanks Pamela. Feel free to comment anytime. I started going through my sons’ boxes of school stuff a year ago and made great headway, wondering why I had kept most of it. But then life got in the way and I haven’t been dealing with either that or the photograph mess. 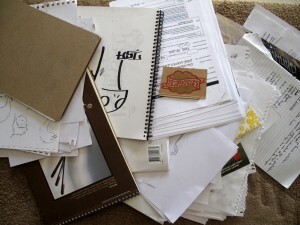 I need to get back to decluttering the paper clutter. I don’t think boys really care if you keep their awards. I found my oldest son’s high school diploma on the floor of his closet a couple of months ago. And really, do we even need to save these diplomas? It can be easily confirmed whether or not someone graduated, right? I went through some cards yesterday and threw out a bunch. I am going to cull one more time to get it down to a reasonable amount. Some of them, I had no idea why I had kept them in the first place. It’s amazing how much paper is still ruling our lives when we are living in the digital age. I thought computers were supposed to do away with the paper and I think ebooks are a really good start to that (even though I still love an actual book in my hands). Maybe in the future schoolwork will be scanned in at school and emailed to the parents. I think that would be an awesome solution to the boxes of “stuff” they accumulate as they go through school. I loved my kids schools in America they were so switched on to the computer age. When my son returned to high school here after our move back I thought we had returned to the dark ages. Not more email communication with teachers, no progress data base to check how he was doing, no newsletters on line to keep up to date with what was going on at the school. Makes me wonder how up to date their lessons were as well. At least his university is more in the digital age. Definitely keep your diplomas or certifications from high school and tech/colleges–I’ve had several employers ask for copies of them, and getting that from a school is just a hassle. I just keep mine in our fire safe box, along with our marriage certificate, SS cards, and other important papers. Oh, I’m in the USA, btw. maths, science and other subjects that don’t involve creativity: You’ll never look at it again. No. Not even for reference. Toss. creative writing, pictures: keepers, at least if creativity means something for you. Can still be tossed and weeded later. But for the self conscious moments in life it might help to look at creative things achieved in the past and be reminded that it is in you. I realized a long time ago that I was saving the schoolwork for me. An 8th grade award usually doesn’t mean anything by the time you head to university. Each year, I kept the things that my kids actually created–the best drawings and the best writing. I’ve since scanned them, backed them up in multiple places, and shared the files via Google Docs and/or Dropbox. Sometimes they ask why I kept all that stuff; sometimes they seem to be glad. It might mean more to them later, but if it doesn’t, they can delete the files. Out of each school year, I probably end up keeping 1 to 3 physical items. I kept so much in the first place because my mother kept *nothing* of mine. She periodically went through my room, throwing everything away. She was trying to create a hoarder, I think, but it didn’t work out that way. When I was a school kid, I used to start my summer holidays with putting the year’s paperwork into the recycling bin. I’m glad I did (and I wonder why I didn’t keep this up at university? ). Honestly, all I kept (and still have) is artwork and stories I wrote in my childhood (partly at kindergarten/school, partly at home). I don’t need my maths stuff or other, but I do like to see and read what I imagined and thought at that time. It’s a bit like looking at a diary: I love to see the drawings of princesses (who look very much like Miss Piggy, to be true), I drew when I was four years old – because they trigger memories of how fond I was of fairy tales at that time. However, my advice in this area would be: let your kids take care of their stuff themselves. (or make them! 😉 ) They’re old enough to decide whether or not they need this stuff – and they’re old enough to keep their clutter in their space (i.e. in their appartment or room). My dad (60 years old, owner of two houses, both with attic and basement), still has about 50 boxes stored in the attic of my granny, just because it’s convenient to not have to go through that stuff – or even get rid of some of it. At some time, your kids ought to house this stuff anyway, so why not give it to them right away, so they get used of the idea that they should find these things a home as well, if they really need it. Btw: For my 25th birthday, I got a parcel containing all my stuff that somehow didn’t move out with me- that’s a possibility as well 🙂 – if it’s only one parcel, otherwise that would be rather expensive. I have found that once they have to take them and live with them and move them, their attitude changes and they let go of some of it! I really don’t think it’s a girl vs. boy thing. I culled my school stuff regularly (and actively avoided showing my mom anything non-essential because she keeps anything and everything) but still had three large binders full at the end of high school. I did a massive purge after my “aha” moment: where I realized that I did not have to physically own a book to know that I studied it or remember the class. Now I have a small memory chest and a folder of sentimental papers, along with a few select books. Now for the actual advice: keep what YOU want to keep for your own purposes. Everything else is your daughter’s and should be put in her room for her to take care of. If you are storing and taking care of it she will see it as “yours” and never actually take possession. Additionally, storing it in their room will force them to consider it alongside their other possessions rather than something else entirely. Let them take care of the storage hassle, if it’s important to them they will keep it. Oh, Aurelia, I like your thoughts and advice. Well done! 🙂 I learned a lot from reading your comment. Thank you. I am wondering if your careful storage of those papers is adding to their allure and making it hard for your kids to throw stuff away. Plain papers versus paper in a glossy sleeve and stored in a nice binder – it makes a difference to me and it might to them. My suggestion is to take all the papers out of the plastic sleeves and have them go through them again. There are also many good suggestions above. And I don’t think it’s a girl/boy issue either; my two were opposite to this. I used to keep the tests of the year, and threw them out at the end of the year when the end report came in. The rest I kept, like 5 boxes full of worthless paper. I threw stuff out in stages. The first stage, I threw out everything I hated during high school (German, Economics – although I did saved maths). The second time, I threw everything away I liked but I thought I wouldn’t use it anymore (Geography, French and more). The last stage I culled books etc. I’m down to one binder with notes that I want to digitalize. It took me years to reach that final stage, but it is worth it! Good for you Nurchamiel. It is quite a while since you first started commenting here. How far do you think you have come since then. Here is a link to your first comment just over a year ago http://www.365lessthings.com/?p=912&cpage=1#comment-5120. Check out what you had to say. Oh great!! Just when I thought I was almost done!!! Hhhmmmm!! This post has reminded me to revisit the ‘SHELF’. As a tutor I am guilty of a lot of paper but not as clutter, and as soon as it’s used it’s compost, on the other hand, school certificates, awards etc, they are neatly stored in an archival binder. All Dance related stuff is stored the same and reports likewise. One thing I like about my sons gear is that the certificates are printed in A5 (half an A4) which is great cos you can get binders to suit. All high achievement whatevers are in a folder so when he does the job rounds it’s altogether. It all sits neatly on a bookshelf and when he needs any of it he can find it. I was glad that his primary school had a ‘Best of Work Folder’ each year and it was samples of all subjects with copies of certs and awards in it. these all fit neatly in the space of an A4 Lever File so they can stay until my son decides what to do with them. School books and notes in general just go out the door at the end of year unless he wants them for reference, when I started doing this I made him part of the process owing to the fact that it is his to organise and purge as he sees fit. I’m happy to store ‘treasures’ till he moves. Thankfully I am a filer so this area has always been controlled. Another way to go would be a framed collage, I did this with a mixture of schoolwork, notes and pics with certs and awards spanning across the years, I consider kids works of art so they are on my walls. I think the main thing to keep in mind is that whilst you are the ‘keeper’ for now, your kids grow and leave, although they may not get the significance of it all now, they may want it later. Sit down with them now and work out a ‘keep plan’ and each child gets to sort and purge. A nice neat binder each and they fill it with what they want. Keep visiting it regularly and teach them that the best in ‘their opinion’ can stay, everything else out. Digital is great but sometimes the real thing ‘looks’ and ‘feels’ great. Many thanks to those who gave suggestions to DVD storage, I am in the process of discussing the changes with the boys and I will let you know how I get on. I found when I started to declutter, I had a mound of artwork for my boys that was larger than 8 x 10 and stacks of school work on regular sized paper. I found I was able to cull out more and more as the boys have gotten older- I was much more sentimental when they were younger, but after the years pass and I see how much paperwork is generated, I am able to let more go. I just went through recently and consolidated it from 14 binders down to 6 which was a great improvement. I ended up doing a mass photography of all the artwork and making them each a physical photobook of it. The other schoolwork I put in binders, one for preschool -2nd grade, one for 3rd-5th and one for middle and high school, with sections for the different grades. They can choose what to do with it when they are grown. My parents had a nasty divorce when I was in college and I ended up with none of my schoolwork (or other childhood items), and it felt kind of like losing everything in a fire or something of that nature where you have no control over the situation. Henave, a warm welcome to you from 365 Less Things and thank you for sharing your story with us. Unfortunately the children (no matter what age) always end up being the collateral damage in divorce. They often end up more wounded than anyone. But look on the bright side you would probably only be decluttering those school papers now and wondering why they were kept had the past been different. Having been listening to declutter stories for the last almost two years it is interesting how ones history affects our attitudes towards stuff. It is like meeting up with some unrequited love from the past years later and thinking ‘Gee I am glad I didn’t end up with him/her!’ after wonder what could have been for years. I will just share with you my experience with school papers. I also kept a lot of papers from my kids through school. When I started decluttering in earnest this was an area I visited quite soon simply because I knew it was a clutter time bomb. I considered whether my life was less rich for not having any old school papers to look back on from when I was young. The answer was no. So then I went through the stuff I had of my kids. Before discarding the items I thought were excess I ran it by them as to whether they wanted to keep it or not. Not only did they not want it but they wondered why I had even kept it in the first place. Both kids had finished high school by this point. I found that the further removed from the time period that their keepsake stuff is from the less attachment they have to it. This is true for all areas not just school stuff. I kept the really special items but they were minimal and I have kept all their reports and important certificates that might be relevant to job seeking but that is all. One day I will pass them back to the kids and they can do with it what they like. I have no sentimental attachment to it. The past is the past and it is best to live in the present. My son now decluttered all his uni papers at the end of each term and my daughter is no longer doing any schooling. If you are intent on keeping your stuff I think the idea of scanning the unofficial documents is the way to go. Sometimes it is nice to have a couple of original personal items but I wouldn’t go overboard. In the end the only documents that will be relevant to their future is their high school certificate and awards. Funny (?) story. My parents were not at all sentimental and kept nothing from our growing up. Well, almost nothing. After my father retired from teaching he volunteered at a local school. He had kept one brilliant student’s drawing and used it as an example for his classes. A decade later he actually turned it over and discovered that the brilliant artist was….me. Still ended up in the bin – just took about 30 years to get there. Hi Wendy, I think you added the brilliant part as embellishment after the fact. Hee Hee! Right now I barely save anything. How about what others have suggested towards things they have a tough time getting rid of…take a photograph or scan it and save it digitally? Personally, that’s a smart idea if one is having doubts about getting rid of stuff (then let the item go and one has the picture to remember it by). Like I said, I barely save any of my kids stuff, so the photograph/scan option is just a suggestion). Our recent move across the pond was mostly a breeze because we decluttered daily. Even then, however, I felt we had too much. So I continue to downsize/declutter each day (and I’m glad to now have access to Craigslist and Freecyle in our town! Yahoo!). how do you think you will go being close to stores with such great clothing sales though. OOOOh the temptation. there are certain items that don’t translate from one location to another. You certainly have come a long way from when you first started comment here on my blog. This really works for us and everyone is happy, we can always print them when need be. I have a rule of thumb not to save any papers like school work, art (unless it was something like painted hands-then you can go back & see how small they were). I do keep my daughter’s report cards, certificates of achievement & the sort. When I graduated high school, I tossed all that stuff. It has no meaning to my life for the future, so why keep it. Every year, my daughter & I go through her tote of stuff & she is pretty good about culling a majority of it herself. We have scanned items & then it is stored on the computer & you can always go through those pictures too & delete them when you are ready. that sounds like a very good procedure. Not only is it sensible to minimise the amount of items kept but it is also very good to involve the child in the process. They need to learn now not to place excessive importance on material items to the point where they can’t bare to part with anything. There will always be those items worth retaining for history’s sake but one needs to be selective about it. I cannot emphasize enough how important it is not to save very many “school mementos” except school photos and awards for major achievements. It is an incredible burden when a parent has saved every little tiny thing — tests with good grades, “also participated” trophies (which isn’t really a trophy and represents no achievement), in-school contest awards, third grade talent show ribbons, every little crayon drawing and art project — and then you and/or your kids have to go through all that stuff in later years due to death, retirement, or downsizing to a smaller home. When I left for college dorm, and moved into an apartment the following year (this was in the ’70s), I took only my clothes, desk, stereo, records, photos, clock, and a select few favorite belongings from childhood. I told my Mom that was all I wanted. She did not believe me and was CERTAIN I would want all of those little scraps, ribbons and papers later on. My mother saved every little thing from grade school “for” me … in case I wanted to look at it later, so I could have it for “memories,” etc. Half an attic full of stuff. She was appalled and terribly disappointed when she downsized to move to a retirement apartment and, as a middle-aged adult, I chose only a file of grade school photos from among the many, many boxes of my “childhood memories.” I discarded or donated EVERYTHING else. Clue to parents: if your child has lost interest in it, don’t save it “for” them. If they don’t want it now, they won’t want it later. REALLY. They won’t. Cull through childhood stuff frequently with your kids and if they have trouble deciding and want to save every tiny thing, this is not a sign of “sentiment,” it is a big, neon, flashing warning light of possible hoarding behavior. Hoarding is a disorder in the OCD/anxiety spectrum and anxiety over making decisions and unwillingness to part with objects can start in early childhood. Seek treatment early on. If you are saving stuff “for your kids,” and they have repeatedly said they don’t want it, ask yourself if you are really saving it for them, or if you are saving it because YOU can’t let go of their childhood. Fill a photo-disk with images of all these objects if you must, if you want it for YOUR memories, but don’t fool yourself into thinking you are saving it on behalf of someone else who you imagine “doesn’t know any better” right now and who you imagine will be sooooo grateful, fifty years from now, that you saved all their report cards from middle school. They won’t. It is clear you have had some experience with this issue. I particularly like this point you made “don’t fool yourself into thinking you are saving it on behalf of someone else who you imagine “doesn’t know any better” right now and who you imagine will be sooooo grateful, fifty years from now, that you saved all their report cards from middle school. They won’t.” I imagine this is on the mind of many parents when it comes to this sort of keepsake hoarding. I often wonder myself if one day the kids will say to me “why did you let me yet rid of….”. I so badly want the stuff out of here though that I am not going to let those thought stop me from getting rid of the stuff. They have had their chance and that is that. I have encountered such events already Dez. I said to my son the other day, do you actually want to keep saving your old Star Wars and Thomas the Tank Engine toys. He said to me ~ “They would be gone already but you keep saying I should keep them.” He is right about they I am the one who thinks he will regret getting rid of those. We have gotten rid of most other things including his leggo but for some reason I thought these were nearer and dearer to him. But perhaps it is just me clinging on to his childhood. Maybe it is time we sold them. if your daughter lives near you why not do the task together. If not do it the next time she visits. It could end up being a lot of fun and it is easier to declutter stuff when you get backup permission from someone else. We (my boyfriend and I) have just been going over these things in the last few weeks. Due to downsizing and wanting to not contribute to our parents messes/junk we got all our old keepsake stuff out of their homes and into ours. Must say that the boyfriend is better at the declutter of old school stuff that I am. He so far has one filebinder sized box, and I have one slightly larger box, but it’s just a sheer reminder of the moving boxes full of stuff. We must emphatise that it was our idea to declutter these items as it was us who wanted to save them in the first place. Silly enough the fact that we were going to declutter it upset out parrents a lot (really my mum cried). WE on the other hand feel lighter for having dealt with it. So as it has been said before, don’t hang onto things for someone else. Let them decide werther they keep or toss. It is interesting how mothers are often the ones who can’t let go of the children’s stuff. I would hazard a guess that it is the mothers who were always goo gar about having babies & children around the home that suffer most from this problem. My mother had five children and was a loving, capable and fun mother but was never what I would call goo gar over babies and kids and she has no clutter from our childhood. My mother-in-law on the other hand had four kids, she also was a capable, loving and nurturing mother but is still goo gar about babies and kids and has all manner of childhood clutter hiding throughout her house. I think it is mothers’ who wish to cling to early childhood “memories” and who have difficulty accepting that the tiny little darlings grow up to be adults you can be proud of, instead of forever remaining little dress-up dolls for you to cuddle. And I don’t think this is less because females actually WANT to save all manner of things, but that we are culturally conditioned to feel “callous, heartless and unsentimental” (against all “feminine virtue”) if we FAIL to save every little memento. It is a terrible conflict to be in but I assure you it is not a cut-and-dried, male/female thing. It is cultural pressure to be “a sentimental mother,” not DNA. I am a woman who saves very little. Mostly photos and a few special things from Grandma and other people who are not longer with us. Memories live in your heart, not in box upon box upon box in the dining room. I never was all goo-gar over babies either, I always treat little ones respectably, like tiny adults, speaking to them softly, smiling warmly, cuddling, and not squealing, cooing, playing kootchy-goo, and making exaggerated facial expressions. I know where you are coming from with this as I have seen evidence of this myself. Evidence of the mothers who cling to early childhood and people feeling inadequate because they don’t fit a certain mould that society seems to dictate as the norm. Parenting is a tricky business and no matter how right a person thinks they are with their methods things can go wrong. I am sure that most mothers are just doing the best they can with what they know. And being as this knowledge has been acquired through observation and their own childhood experience it is usually unique to each and every one of us. I have a friend who is a new entrants teacher at Primary School – she often gets asked by parents about artwork – she recommends taking a digital photo of it and then quietly getting rid of it. And then its all put on a special flashdrive in the digital picture frame. The same can be done with certificates and awards. Or you could take a photo of the kids holding the artwork or certificate. BUT ones from High School level up – must keeps. Mine were lost and 20 years on it still comes back to hassle me from time to time. And then one gets to an age where even the high school ones become redundant. Employers are often only interested in your fairly recent past when it comes to hiring. Anything too historic is then out of date. I would really recommend putting together at least 1 binder. I have a school album for each of my kids made with only their signatures, artwork, schoolwork, etc. and that year’s photo. They really enjoy looking back and it’s fun to see the growth in their work. They will end up with 2 total when they graduate, that’s not really lots. I guess I’m a tactile person. That sounds like a reasonable amount of sentimental items to me too Gloria.